I have dedicated much more time to reading in the past 6 weeks (Since the beginning of December 2014), and as a result I have finished one more book – “A Whole New Mind“, written by Daniel H Pink. This book was published almost 10 years ago – in a distant 2005, and I have had enough references to it from friends & colleagues in the past years, and I am happy that I have finally sit down and read it. 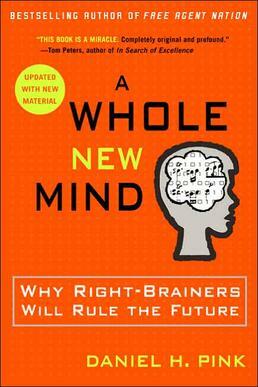 The main discussion of the “A Whole New Mind” is on the human brain and its functionality – essentially we have 2 parts and 2 principal groups of people: Left-Brainers & Right-Brainers. This concept is based on the fact that left & right parts of a human brain are responsible for different functions – while the left part of the brain corresponds more to the logic, the right part of a human brain is responsible for the creativity & emotions. Arguing that a lot of current professions and tasks will be inevitably replaced by cheaper labour and computers, Daniel Pink is making a very good case for business success – create something that is touching humans on a whole new level, something that is impossible to imitate. This book goes into the analysis of the 3 recent principal “ages” – Industrial, Information & Conceptual. The Industrial Age corresponds the rise of the factories and factory workers, the Information Age is the prevalent age for the modern countries – information & analysis are the keys to the progress and success right now, but in the 21st Century the Concept Age is taking over the Information Age. The Concept Age is all about empathy, creativity & design. We (the children of the Information Age) might argue about its usefulness but the undeniable part in 2015 is that it is already here for a number of years. Revealing what he considers to be the 6 principal senses – Design, Story, Symphony, Empathy, Play, Meaning – Daniel Pink explains how they should be applied on the practice and suggests some interesting strategies and literature to follow. In the past 6 years I can feel that I have known enough local & international business that were very much influenced by this book or the similar thoughts, especially all the focus on the Design Thinking is the element I can point out. It is interesting that just after 10 years, some of the technologies described in a book in the way that computers will not be able to dominate soon – are considered to be already well in the domain of the machines – face and emotion recognitions for example. I have felt that a lot of my own thoughts are being reflected in this book. A very possible and logical future for the humanity lies in developing human side and not focusing on the tasks that a machine can eventually learn. We should all focus on making each other happier people.